ca 340 - 330 B.C. 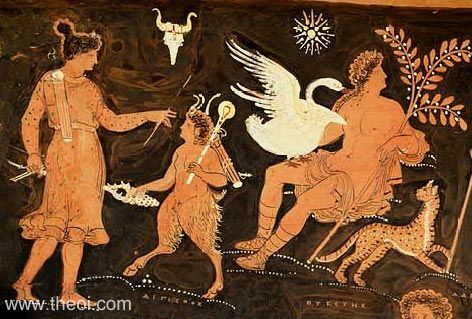 Detail of the gods Artemis, Pan and Apollo from a painting depicting the exposure of the infant Aegisthus son of Thyestes. Artemis wears a quiver and holds a bow and arrows. The Paniscus (little Pan) holds a conch-shell horn and a bow and quiver of arrows hanging from a club. Apollo is seated with a branch of laurel in the crock of his arm, a swan on his lap and leopard by his side.